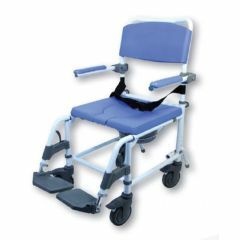 AllegroMedical.com presents The 180 Aluminum Shower Commode Chair. EZee Life aluminum attendant shower and commode chair is a hybrid standard 18" commode and a transport chair in one. The chair comes with four 5" locking casters to provide safety when the user does not need to be moved. The seat cut-out provides comfort and allows the chair to be positioned over a standard toilet for use, but also comes with a bucket to be used anywhere it is required. The aluminum frame of the Shower Commode Chair is an attractive white color and is also resistant to rust which makes it ideal for the shower. Footrests come standard and include adjustable height and angle footplates. The Aluminum Shower Commode Chair is ideal for anyone who is looking for a shower chair and commode for their home. wheels work well. nice color. arms flip up. not enough padding on sea. oversized removable bucke. arms don't lock. over toilet use. shower use. Are the footrests movable or removeable? Can a tray be put on this commode? If so does this company make one for it?